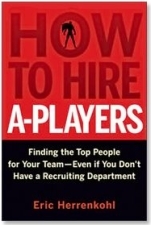 Eric Herrenkohl, recruiting specialist and author of How to Hire A-Players, argues that hiring just one “A-Player” can save an executive’s marriage as well as add immeasurable value to his business. Given the current economic situation, he says there is no better time than the present for small business owners to build the organizations they deserve – and desire. Eric joins host, Anita Campbell, to provide his top 5 tips and step-by-step instructions on how to find, interview, and hire the “rock star” employees that every business needs. (2:01) First Eric, can you tell us a bit about yourself and your background? (3:10) Can you tell us what an A-Player is in your estimation and how does one get to become an A-Player as an employee? (4:17) Can you talk a little bit about the top ways that you can find and interview these “rock star” employees? How do you get them and how do you know when someone is an A-Player? (5:27) Where do you go to find A-Players? (6:37) You’re not saying we should pretend to have a job opening when we don’t, correct? (7:58) If it’s not a wise idea to pretend you have a job opening when you don’t, what do you say to a candidate to explain why you’re interviewing them when you don’t have a job opening? (9:33) What is your next tip? (12:49) What is the A-Player profile? How do you spot an A-Player? (14:32) What is it that puts that one candidate ahead of everyone else? How do you actually determine what those “knock out” factors are? (19:27) Eric, how do you find an A-Player? Is there a particular background profile or set of experience that you look for to identify these A-Players? (21:47) If you had to point out the hiring mistakes that small businesses and executives make, what would they be? (23:05) If you had to determine what the most important questions are to ask during an interview, what would the top questions be that you recommend we ask? (25:36) Tell us about your book, is it out? (26:11) If you had to leave listeners with a few final points, what would they be? (27:04) Eric, where can people find out more? Eric Herrenkohl: How could a “B player” become an A player? I will listen to the podcast during this weekend. These wrapup posts are so uplifting for small business owners. Thank you very much for compiling these posts.